PHOENIX, Arizona – 4th April, 2017 - ON Semiconductor (Nasdaq: ON), driving energy efficient innovations, has unveiled AR0521 CMOS image sensor – the first imaging product based on a 2.2 micrometer (μm) Back Side Illuminated (BSI) pixel technology platform targeted specifically at security and surveillance applications. The advanced imaging solution offers 8, 10, or 12-bit outputs and boasts excellent video performance at 5MP 60 frames per second (fps) with a 1440p mode for 16:9 video. The superior low-light performance – often an important requirement in security camera applications – is largely due to the larger 2.2 μm BSI pixel that offers higher linear full well and lower noise than a smaller pixel. Incorporating both an electronic rolling shutter and global reset release, the AR0521 also offers advanced line synchronization controls for multi-camera (stereo) support. The ability of the AR0521 to produce extraordinarily clear and sharp images is enhanced by sophisticated digital processing functions, including integrated color and lens shading correction, digital gain and dynamic defect correction. Primarily aimed at remote video surveillance applications, the AR0521 consumes very little power even when operating at full resolution of 60 fps at 10-bit output. The operating temperature range of -30°C to +85°C ambient allows the device to be used successfully outdoors in harsh environments. 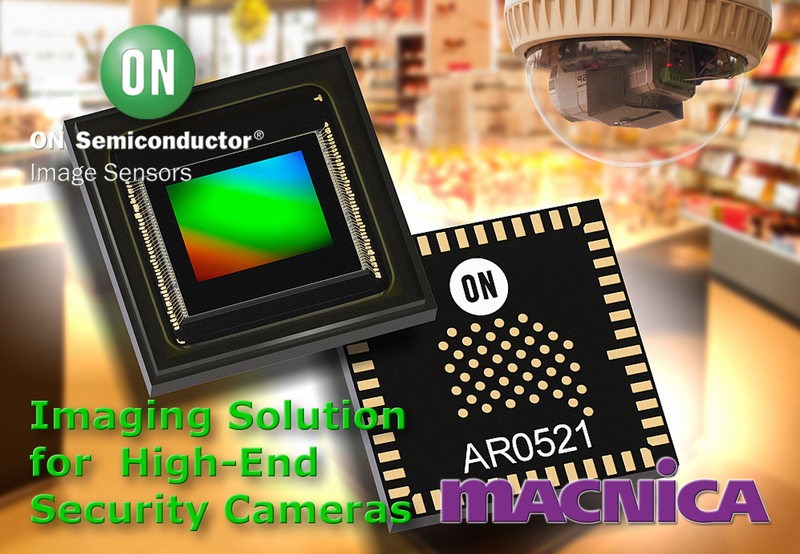 "The ability to deliver high resolution, high quality video feeds in low-light conditions is becoming increasingly important in many applications,” said Gianluca Colli, Vice President and General Manager of Consumer Solutions Division, Image Sensor Group at ON Semiconductor. “This new device pushes the performance boundaries and will enable the development of enhanced indoor and outdoor security systems. Particularly key to its success will be the higher resolution that does not impact low light performance and the ability to generate high dynamic range output at frame rates of 30 fps." As a result of the programmable optical format (4:3, 16:9 & 1:1) the AR0521 is suitable for multiple use cases in mid- to high-end security applications including panoramic security cameras, birdseye security cameras, long range security cameras and speed dome security cameras. ON Semiconductor (Nasdaq: ON) is driving energy efficient innovations, empowering customers to reduce global energy use. The company is a leading supplier of semiconductor-based solutions, offering a comprehensive portfolio of energy efficient power and signal management, logic, standard and custom devices. The company’s products help engineers solve their unique design challenges in automotive, communications, computing, consumer, industrial, medical and military/aerospace applications. ON Semiconductor operates a responsive, reliable, world-class supply chain and quality program, and a network of manufacturing facilities, sales offices and design centers in key markets throughout North America, Europe, and the Asia Pacific regions. For more information, visit http://www.onsemi.com.